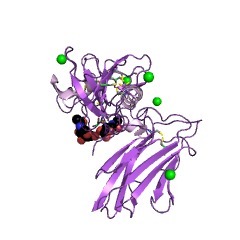 The WSC domain is a putative carbohydrate binding domain. 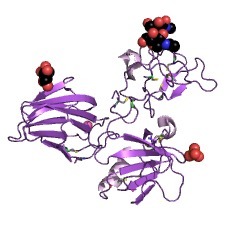 The domain contains up to eight conserved cysteine residues that may be involved in disulphide bridges. 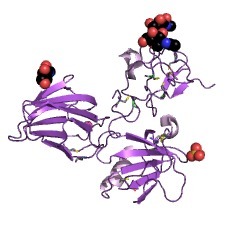 The Trichoderma harzianum beta-1,3 exoglucanase contains two copies of the WSC domain, while the yeast SLG1 protein contains only one. There are 6536 WSC domains in 2069 proteins in SMART's nrdb database. Taxonomic distribution of proteins containing WSC domain. This tree includes only several representative species. The complete taxonomic breakdown of all proteins with WSC domain is also avaliable. Click on the protein counts, or double click on taxonomic names to display all proteins containing WSC domain in the selected taxonomic class. Disruption of YHC8, a member of the TSR1 gene family, reveals its direct involvement in yeast protein translocation. Genetic studies of Saccharomyces cerevisiae have identified many components acting to deliver specific proteins to their cellular locations. 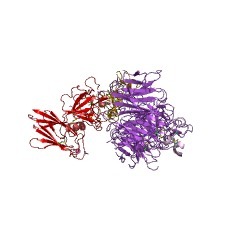 Genome analysis, however, has indicated that additional genes may also participate in such protein trafficking. The product of the yeast Yarrowia lipolytica TSR1 gene promotes the signal recognition particle-dependent translocation of secretory proteins through the endoplasmic reticulum. Here we describe the identification of a new gene family of proteins that is well conserved among different yeast species. The TSR1 genes encode polypeptides that share the same protein domain distribution and, like Tsr1p, may play an important role in the early steps of the signal recognition particle-dependent translocation pathway. We have identified five homologues of the TSR1 gene, four of them from the yeast Saccharomyces cerevisiae and the other from Hansenula polymorpha. We generated a null mutation in the S. cerevisiae YHC8 gene, the closest homologue to Y. lipolytica TSR1, and used different soluble (carboxypeptidase Y, alpha-factor, invertase) and membrane (dipeptidyl-aminopeptidase) secretory proteins to study its phenotype. A large accumulation of soluble protein precursors was detected in the mutant strain. Immunofluorescence experiments show that Yhc8p is localized in the endoplasmic reticulum. We propose that the YHC8 gene is a new and important component of the S. cerevisiae endoplasmic reticulum membrane and that it functions in protein translocation/insertion of secretory proteins through or into this compartment. A screen for upstream components of the yeast protein kinase C signal transduction pathway identifies the product of the SLG1 gene. We employed the constitutive BCK1-20 allele of the gene for the MAP kinase kinase kinase (MAP-KKK) in the yeast Pkc signal transduction pathway to develop a genetic screen for mutants in genes encoding upstream components. Transposon mutagenesis yielded a mutant that was completely dependent on the active allele in the absence of osmotic stabilization. The transposon had integrated at the yeast SLG1 (HCS77) locus. 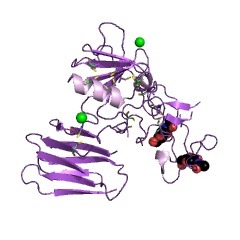 This gene encodes a putative membrane protein. Haploid slg1 deletion strains are sensitive to caffeine, as expected for mutants in the Pkc pathway, as well as a variety of other drugs. The response to elevated temperatures and the dependence on osmotic stabilization depends on the genetic background. Thus, in the strain used for mutagenesis, disruption of SLG1 causes the cells to become non-viable in the absence of osmotic stabilization at both 30 degrees C and 37 degrees C. In a different genetic background this phenotype was not observed. Sensitivity of the haploid deletion mutants to caffeine can be partially suppressed by overexpression of genes for other components of the Pkc pathway, such as PKC1, SLT2, ROM2, and STE20. In addition, a SLG1-lacZ reporter construct shows higher expression in the presence of caffeine or magnesium chloride in a wild-type diploid background. A family of genes required for maintenance of cell wall integrity and for the stress response in Saccharomyces cerevisiae. The PKC1-MPK1 pathway in yeast functions in the maintenance of cell wall integrity and in the stress response. We have identified a family of genes that are putative regulators of this pathway. WSC1, WSC2, and WSC3 encode predicted integral membrane proteins with a conserved cysteine motif and a WSC1-green fluorescence protein fusion protein localizes to the plasma membrane. Deletion of WSC results in phenotypes similar to mutants in the PKC1-MPK1 pathway and an increase in the activity of MPK1 upon a mild heat treatment is impaired in a wscDelta mutant. Genetic analysis places the function of WSC upstream of PKC1, suggesting that they play a role in its activation. We also find a genetic interaction between WSC and the RAS-cAMP pathway. The RAS-cAMP pathway is required for cell cycle progression and for the heat shock response. Overexpression of WSC suppresses the heat shock sensitivity of a strain in which RAS is hyperactivated and the heat shock sensitivity of a wscDelta strain is rescued by deletion of RAS2. The functional characteristics and cellular localization of WSC suggest that they may mediate intracellular responses to environmental stress in yeast.